Well another stormy wet week with a Wednesday so wet and windy, I was glad to be indoors. The ground around me is almost at saturation point now and needs a good few days of drying out, I dread to think of what it will be like if we get another downpour like Wednesday. Work wise managed to get a bit done despite the weather, basically just pruned apple trees for most of the week, so lovely being up a large apple tree, looking for miles on a dry and sunny day. The six this week mainly come from my little battered garden, my bulbs are the thing that give me so much pleasure in January, they brighten my garden up. As we only rent our place, they are mainly in pots in case we have to move. I would hate to forget one and leave it behind! Ahh yes sorry I should of added a snowdrop warning earlier, I do grow a few all in pots, this is a new one I brought in the autumn as a bulb and it’s done rather well. It’s called snow fox. 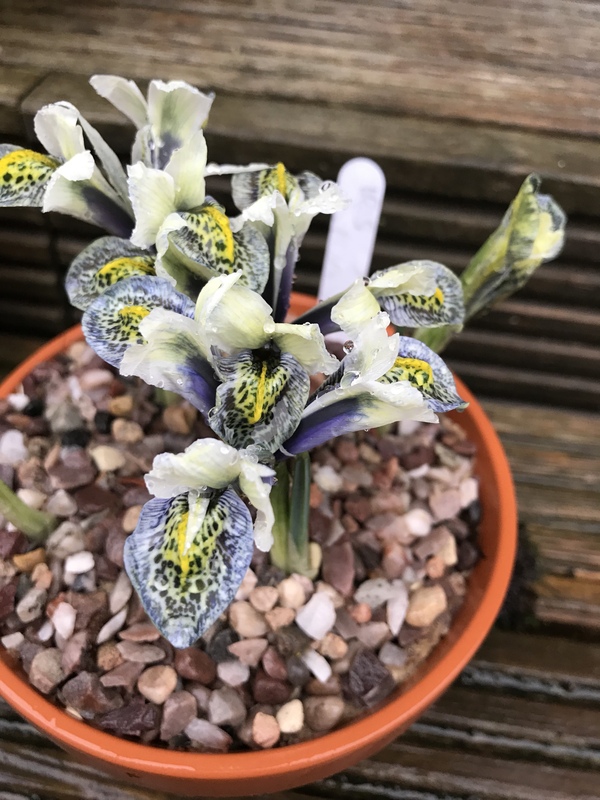 This was my most expensive reticulata hybrid I brought and the bloody slugs have managed to avoid the sharp gravel and take chunks out of my flower. Bloody things! ‘One was not amused’ anyway, I hope it bulks up for next year, oops forgot the name it’s called Orange Glow. Yes you guessed it another snowdrop but a double this time and it’s indeed another new one for my collection, added in the autumn after I had seen it growing in a garden. it’s name is Dionysus and never ever ask me to say it! Still a lovely addition! Nope not finishing this week of a shot of our bins, a good photographer always removes the clutter around the subject they are photographing, lack of time or laziness prevented me moving the subject but the key thing is that the Venus flytrap has put on a flower spike! Very excited to see what happens when it opens, never seen one in flower before! Oh gee, I just mentioned that I did not do mine for this week. Now I must see what everyone else is showing off! I do admire you having everything growing in pots. What is the secret of pot success would you say? That double snowdrop is amazing when you hold it like that so we can see it – such a pity most are so close to the ground it’s impossible to see up into them. They don’t thrive here in my London soil but I do have a few (although I must have planted hundreds!). At first glance, I thought Wasp was growing w/the succulents & the image wowed me. Even in proximity, it’s a lovely combo, the complimentary greens, how the light makes the tips of some of the succulents look almost white to highlight the snowdrop. I make stick a few bulbs in my succulent pot this year. We move a lot, so I always have some bulbs in pots, but they multiply like rabbits, so I leave a trail of spring bulbs behind me wherever I go. Will the flytrap appear in a future Six, do you think? Thank you Fred 😀 snowdrops are something a little special aren’t they 😀 which one did you get?